You've probably guessed from my last few posts that I'm loving the idea of subscription boxes and having random treats every month.. but what you may not know (if you don't know me personally!) is that I LOVE cooking and of course the eating part of it too! So when I stumbled across the idea of having gourmet food items delivered to me monthly I signed up straight away! Heres how the box comes packaged... its a lot bigger than the Birchbox package which is always a great sign! The box looks stuffed with lovely bits as soon as you open up the paper! Here is a run down of all the treats inside this months box, although I haven't tried all of them yet! This was the first thing i munched on out of the box- mainly because it was easy to pack in my bag for lunch at work. They are dried apple crisps and rather beautiful I must say. They had a nice chew to them and a punch of sweetness which satisfied my sweet craving in the afternoon! A box of 24 packs is £12.. only 50p per bag! that there weren't more in the bag! I'd buy these again if I saw them in a shop nearby. My fav thing to snack on at the moment is popcorn, give me popcorn over crisps any day! I've tried Zaramama popcorn before so I already know this brand. I haven't yet tried this yet as I've already got a bag of pre popped corn in the house. I've had a nosey on their website and Rich Ruby Red is said to have a distinct nutty flavour! Zaramamas popping corn is available in 12 colourful varieties- each type has its own taste and texture-each with its own popping and expansion rate- wow! I'm a savoury popcorn fan so I'm pleased they do a cheese seasoning and a chilli and lime one! Zaramama's do more than just kernels! They do popping oil, air poppers and seasoning selection packs. I didn't get any of the seasoning with the kernels. I'll be honest- my first thoughts when I saw this product in the box was "Ohh... is this the leftovers from xmas?" . The pyramid style teabags smell amazingly christmassy. I'm just conditioned to think of the festive period so maybe these will be saved for later in the year! Although the more I look and smell them I'm starting to think they will be yummy in apple juice! I've checked out Taste's website just now though and I honestly think my seasoning dreams have come true! They have a huge range of different rubs, spices,infused oils and flavoured salts. Rosemary and garlic infused oil- how yum would this be drizzled over a pizza?! Harissa blend- I love the deep flavour and kick Harissa brings to all sorts of dishes. We even put Harissa in our gravy for sunday dinner! Taste Gourmet Spice Company are at the BBC Good Food Show next week- i'm going too! The website has such good descriptions of their products and gives ideas for cooking. Their tag line is "Give food attitude!" I got something that doesn't seem very fitting to this time of year. Taste Gourmet Spice Company's website is tiptop- they have a whole section dedicated to recipe ideas. I love when companies do this- it shows they care about the end product their customer may be cooking and want to inspire us to be creative with their products. Milk chocolate with sea salt- I love the mix of savoury and sweet so this would be top of my want list. Dark chocolate with hazelnuts and raisins- can't beat a bit of chew in your choc! Apple brandy caramels- sound yummy! Raw optimum nutrition snacks, organic 100% natural, gluten and GM free! These are an odd snack for newbies but I enjoyed them! The texture is grainy and crunchy mixed with chocolatety yum. They are snack bites designed to slow release energy and fuel you throughout the day. Inspiral have an eco cafe/organic bar/music venue in camden too! vegan, gluten-free,lactose-free, GMO free and MSG free! Its not just a snack- Inspiral is a whole concept of clean living- see their website! the portion in the bag is so huge i couldn't manage them all! Another hit Flavourly! I am yet to use this kit but we've used a Kents Kitchen before and loved the concept and flavours. I like that the kits come with infused cooking oils! On the back of the packet it gives cooking instructions and the small list of ingredients you need to add. This one is designed to go with chicken. I fancy trying the Fire cracker sweet and sour and the Rogan josh.. wonder if it will be anything like the curries I had in India?! Kents Kitchen does all sorts of cooking bits on their website- I would love to try the miso style prawn and garlic noodles! The packaging looks great but once you've emptied out the pots they go straight in the bin. Maybe if the little pots had reusable lids instead of clear film they could be re-used to store spices? I'll be doing a cooking blog post on this soon- keep an eye out for the end result. I enjoy hot chocolate but very rarely have it. I think this is because on the odd occasion I have one from the big coffee chains and I just find them so sickly sweet. So when I saw this in Flavourly I was happy! I am yet to try it but my goodness it smells amazing. A mixture of chocolate, turkish delight and mint. The thing that threw me though was the name! I can't smell any cinnamon! I'll let you know via my instagram (@hollylucyhp) how it turns out when i try it. The company is the making of two ladies dreams! Have a read on their site and find out their story. 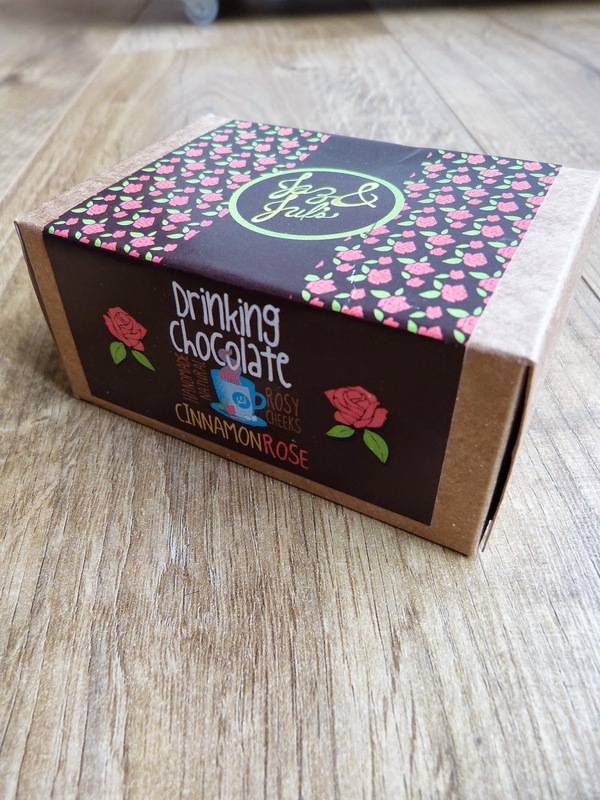 The packaging is cute and the choc is handmade in London! the name doesn't reflect the scent but this might change once I've tried it. You are either a lover or hater of olives... thankfully I'm a massive massive lover! Whilst writing this post I've polished off a pack of these. They are nice and oily, great flavour and generally just a bloody great olive! 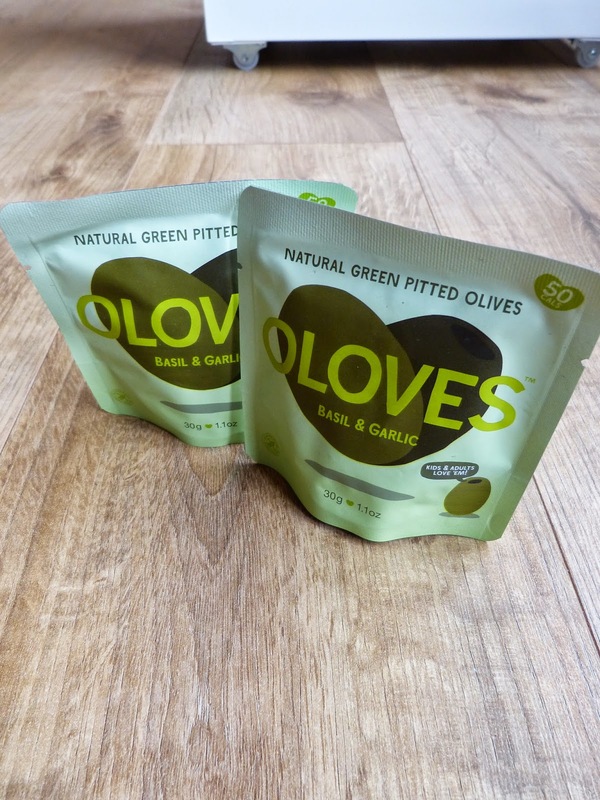 Oloves website is ace- gives you loads of detail about the nutritional value of olives! Each pack is 50 calories and a handy size for lunch boxes. The olives are full of flavour- you can tell they are good quality! Great portion size for one person. There isn't anything I dislike about these yummy snacks! Sorry Stoats I haven't tried this bar yet! Fig and date though.. sounds interesting and just from having a squeeze of the bar I can tell its one of those that will fill me up for the whole morning. Great with a cuppa I bet! Fruity pressed gluten free snack bars in Cocoa + orange and Blackcurrant. I've tried the Cocoa and orange one this evening on my way home and I enjoyed it. The texture is something i've not had before, kind of cakey but feels more healthy! The smell of the orange is intense and lovely. 1 of your 5 a day too. Mmmmm i've just tried one of these drops, they are really silky dark chocolate! They are the type of choc's I'd imagine are lovely straight from the fridge with a bit of a bite to them. Only in small doses though.. I couldn't eat a whole packet in one go! Beyond Dark contains up to 3 times for antioxidants than other dark chocolate and pack a really lovely raspberry hit of flavour in the background. I like the simple packaging of the tea! I've not tried this yet but when looking at the ingredients it found its 100% pure peppermint leaves- I've had peppermint tea before and enjoy it occasionally! The thing i've learnt from this box is that you should brew the bag for 3-6 minutes.. I don't think I've previously had the patience to wait that long so maybe I'll try it next time. Peppermint tea is meant to be good for digestion,stress relief, refreshing your mouth! Sweeteas don't have a website at the moment but I'll update this when its up and running! I have really enjoyed branching out and getting something through the post that both me and the Mr can enjoy. It adds a bit of variety to our snacking and gives us ideas of things to add to our meal planner for the week. Some of the bits didn't impress me as much as others but its nice to try different brands. After looking at all the websites of all the companies I'm impressed to see all of the products are made here in the UK and each have a story behind them. Im off to the BBC Good Food show next weekend in Birmingham so Im looking forward to seeing the Taste Gourmet Spice Company there as well as hopefully finding the other companies in amongst the stalls. I've had an email from Flavourly today telling me that the price of the box is going up soon to £20 per month (including postage). Yes this might seem steep but its something we both enjoy and Flavourly have promised to up the box game and make it a deluxe gourmet box from now on! If you'd like to subscribe please use the link below, both you and I get £5 free credit added to our accounts! I hope you've enjoyed this post and sorry its a bit lengthly but that shows the amount of stuff you get crammed into the box! What a fun box! I love this idea! That cool red thai meal kit is so awesome, I want it!! I really want to subscribe to a monthly food box! You get so much stuff in there too. So I guess £20 wouldn't be too bad.